"Hell Erupts" penciled preview pages ! You can now friend me on Facebook! Add HELL ERUPTS on Facebook TOO! Dark Art Gallery show this weekend! The Chicago Horror Firm Festival! Hell Erupts at TCS Convention this Saturday! My art and preview pages for Hell Erupts will be on Display at the TCS Convention, Aug. 4th. "Clive Barker's NIGHTBREED (Cabal Cut) with star ANNE BOBBY (in Person!) with HELLRAISER & CANDYMAN on FRIDAY, JULY 13 (PORTAGE THEATER) & SATURDAY, JULY 14 there's a NIGHTBREED Midnight show. Horror fans have wanted to see NIGHTBREED UNCUT (45mins. longer) for 20 years! Here is your chance!" Its a summer, B-Movie Monster themed, Halfway to Halloween party! Yeah tha'ts a lot to say, but that is exactly why its a Monster Mash-Up! This is the first time anything like this has ever happened in Elgin. With the success of Nightmare on Chicago Street last year in downtown Elgin, we found out that there are a lot of Elginites, and other folks from around the area that are REALLY into horror! Why keep them waiting until next October? Lets keep the excitement going all year long! Kids under 12 FREE both days!! Tickets available online soon, and at the door both days!! From 3 (of the many companies) that brought 4000 people a zombie wasteland last year at Nightmare on Chicago Street, Dreary & Naughty, Horror Society and Wicked Whimsy Studio are proud to present Monster Mash-Up!! Now in it's 3rd year, Psychosis is Illinois' most interactive haunted house! Classic old B-Movies, Indie Horror, Shorts, Trailers and much MORE! Movies to be announced soon! SCHEDULE OF EVENTS AND MOVIES!! Indie Horror Film Fest starts this Friday! Finally, new art! Come see! I have 6 new paintings showing for the first time this weekend as well as prints and sketchbooks. Hope to see you there! I'm featured in the "Art of Horror" Exhibit coming up this weekend (Fri. Sept 23 through Sun. Sept. 25) at the Chicago Horror Film Festival- http://chicagohorrorfest.com/2011/09/18/alan-rehbein-hellerupts-com-at-chff-2011/ at the Portage Theater. I'm really looking Forward to it. This is the 3rd year I've been at this Festival and I allways have a great time! grrrr. LJ won't let me put in photos or links today. Sometimes life just happens. Not that long ago I was gearing up for a buzy summer full of events showing my art. Now due to a series of family emergencies everything has been put on hold or canceled. I am hopeful that I will be able to resume in the fall but right now everything is a wait and see situation. We Burn gallery show starts this friday. Monster Wheel Death Race and Chiditarod shopping carts are just two of the works featured in an upcoming exhibition called “We Burn: Chicago Burning Man Art”. The multi-media gallery show opens at the Flat Iron Building (1579 N. Milwaukee Ave, Chicago, IL) on April 1. The opening coincides with the building's monthly First Friday event from 6-10pm. The closing party on April 16 from 6-10pm will feature an artists' reception, live music, performances, and light snacks. Both events will have art available for purchase. Other Burning Man artist works will include photography, sculpture, video, works on paper, paintings, mixed media, installations, and performances. Burners are known for interactive art and for challenging the expectations of art enthusiasts. Burning Man is an annual event held in the Black Rock Desert of Nevada, drawing 50,000 artists into a harsh environment for a week of “radical self expression”. Chicago’s Burning Man Community numbers in the hundreds, and is known for high profile public art and events. This show features work by Zac Franzoni, Phillip Solomonson, Marci Rubin, Maria Scileppi, Tim Krueger, Nichelle Lawrence, Gabriel Garcia- Fraire, Jeff Austin, Sara Egner, Michael Schiele, Pat Hilander, Sally Sachs, Elysia Lock, Chiditarod Art Carts, Monster Wheel Grand Prix, Richard P. Bennett, Ellie Sorokin, April Randall, Lera Gershevich, Leo Spektor, Alexa Razma, Sloan, Alan Rehbein, Ben Heise, Edible Alchemy, Eric Becker, Gordon Kummel, Karlis Kandero, and Seth Gershberg. The building is open to the public Monday through Friday from 10AM-8PM. Artists in We Burn will be on hand on weekend afternoons from 2pm-6pm for the run of the show. This event is made possible with generous support from the Bold Urban Renaissance Network and patrons like you. Halloween Havoc- Today Through Oct 29th! I'm joining a bunch of other groovy monster/ horror vendors and artists and Showing off my art at Hallowwen Havoc 3 this Week at the Portage Theater. The Hell Erupts photo Op will also be there to get your picture on. This Is my last show of the Halloween season and it's a doozy. hope to see you there! Next up on the halloween season agenda- the Horror Society Film Festival 2010 October 23rd and October 24th at the Portage Theater at 4050 N. Milwaukee Ave Chicago, IL 60641. Thank you to all the people who stopped to take a picture in the Hell Erupts photo op at the Chicago horror film fest. I'm busy finishing up some new work for the upcoming 1901gallery show so pics will go up next week. Missed your chance to "become" part of Hell Erupts? You'll have another chance at the 1901 Gallery this weekend. I'll Be debuting new Paintings in my "Haunted Boudoir Portraits of the Dammed" series and more art perfect for the Halloween season. come check it out! 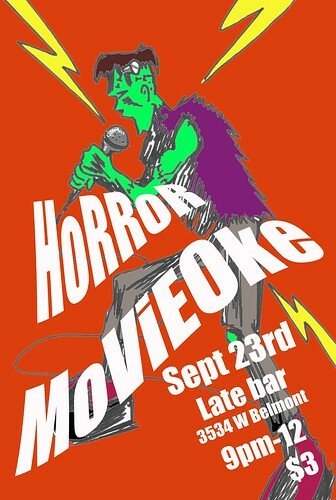 Horror Movieoke Thursday Sept 23rd! It's like karaoke..... with horror movies! !